I can’t tell you the number of times someone has reached out to me and said, “My husband and I are considering adoption. What should we do?” Gracious, I remember those days. It kind of felt like (and still does most days) we were standing on the edge of the Grand Canyon, humbled by what was before us, excitedly freaking out that we were finally there, and totally clueless about how to take our next step. Like our little one was on the other side, and we, non-experienced Grand Canyon traversers, were about to set out on the journey of a lifetime, hiking boots (and chocolate) in tow, but no map in hand. Having adopted once, and in the process for a second time, we are certainly not experts. One trip across the “Grand Canyon” does not a tour guide make. However, we’ve got a little experience under our belts and a number of adoptive family friends that have kindly taught us a thing or two (or three). So here we go, friends! From our little family to yours, 5 Tips on how to prepare for your journey. It’s a wild ride...er...hike, but totally, totally worth it. When we take a gander at scripture, there’s no denying the Father’s heart for the fatherless. I could list a thousand scriptures...buuuuut...lucky you, I’ll leave that for another post;) And there’s also no denying that He calls His church to join him in caring for the orphan. But not every family is called to adopt. There are so many ways we can fulfil this calling. So first things first, ask Him to make His calling clear. And trusting that He will, ask Him for the boldness to step forward confidently, wherever His is leading. Adopting is an unspeakable blessing. But it is not a road without obstacles and pain. So don’t pursue it out of selfish ambition, peer pressure, or obligation. You’ll need to cling to your calling on the difficult days. However, if He has called you to it, don’t waste the calling waiting for Him to make every detail clear. That likely won’t happen immediately (or ever). Instead, trust that as He promised Joshua, He promises us. He is with us wherever we go. It is sooooo not uncommon for a husband and wife to be on two different pages. Heck, sometimes even in two different books. Ya heard? Frustration and impatience won’t get you far, though. One thing is for certain, if the Lord is calling your family to adoption, He will work on each of you in His own perfect timing. Remember, He is the master heart changer. Us? Noooooot so much. This is not the adventure you want to drag your spouse into. So wait, and pray. For your spouse, and for yourself. And watch Him work:) Either way He leads, this season of prayer can be life changing for both of you. Nothing beats studying scripture and allowing the Holy Spirit to guide you as you seek His will for your family’s life and potentially take the first steps towards adoption. His Word speaks powerfully. 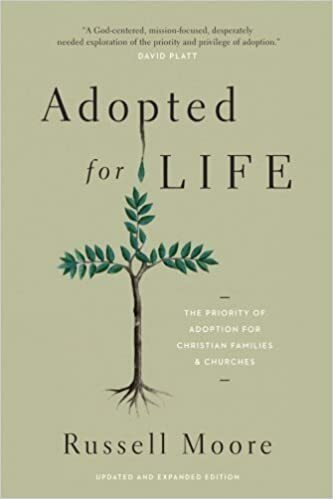 But we also highly recommend using other resources like books and sermons written specifically to dig into Biblical truths about adoption.The first book we read when we started praying through adoption was Adopted for Life by Dr. Russell Moore. It’s what’s up, y’all. The Lord used this book to capture our hearts with the beauty of the gospel through adoption. And as we read it, our hearts were tuned to His. We give it 3 thumbs up. But you don’t have to stop there! There are so many amazing books out there. Other great ones include: Reclaiming Adoption, Orphanology, and The Connected Child (great to read post-adoption). I love a good book, but don’t hesitate to hit up some sermons too! If you’re anything like me, you’ll be devouring this stuff as you try to discern His calling on your family’s life. Not to mention, God has used them to encourage my heart when this road seems daunting. The statement “it takes a village” has never been truer. Our village has been our lifeline. Start connecting with adoptive families. Ask them over for dinner and then ask them to share their story! More than likely they are eager to talk your ear off about adoption (the pretty, and the not so pretty). We’re kinda weird like that;) Of course families within your community are a total plus. But the interwebs ain’t shabby either. Social media is a great way to connect with adoptive families and follow along on their journey pre and post-placement. Use the wisdom and experience of people that have gone before you. A little piece of grace on the journey, sister. Take hold of it and don’t try to do it alone. Remember the Grand Canyon? Welcome, my sweet friend. This seems overwhelming now. I get it. But it will get clearer as you begin to take steps forward. Trust me:) There are a variety of different routes you can go through to adopt: private adoption, consulting agency, adoption agency, and foster care. I won’t bore you with all of the details here. But depending on whether or not you feel the Lord directing you to international or domestic adoption, begin researching avenues for adopting the child you believe God has for your family. Most agencies will offer (possibly require) either an information meeting or a one-on-one consultation. Attend, set up an appointment, and ask. all. the. things.